On our planet, the egg has been almost universally viewed as a symbol of rebirth and fertility since ancient times (imagine ancient eyes seeing something living come out of something hard and apparently inanimate!). Cosmic eggs are also the part of many creation stories around the world. Hardly surprising that it was adopted by the early Christians as one of the symbols of Christ’s resurrection. Eggs were symbols in spring equinox ceremonies throughout the Mediterranean and Middle East in ancient days. As we know, many Christian holidays and symbols stem from pre-Christian practices. But, as this is not a religious blog, these interesting works of art are as close as I’m coming to the subject of Easter! This isn’t usually what contemporary American’s conjure up in their minds when they yearn after egg salad. Where’s the mayo? 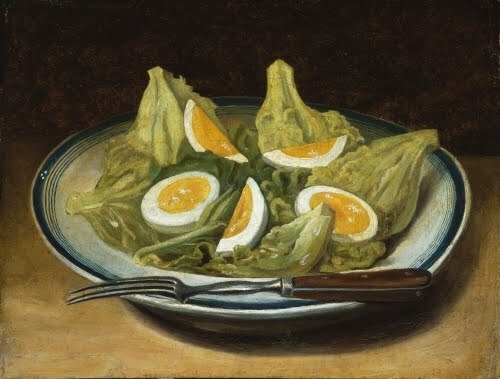 But, honestly, every time I see this painting when I’m at the MFA, it makes me hungry. And what is more representative of the no-nonsense realism—even in the most common things—that characterizes early American art? As far as the still-life genre in American painting, it really didn’t exist until the Peale family came on the scene in the latter half of the 1700s. Before the second decade of the 1800s, still-life works were confined to botanical studies. Charles Willson Peale (1741–1827), the patriarch of the Peale “dynasty,” turned over his successful portrait miniature business to his brother James (1739–1831) in 1795. When James’s eyesight began to fail (go figure) around 1820, he began painting still life. 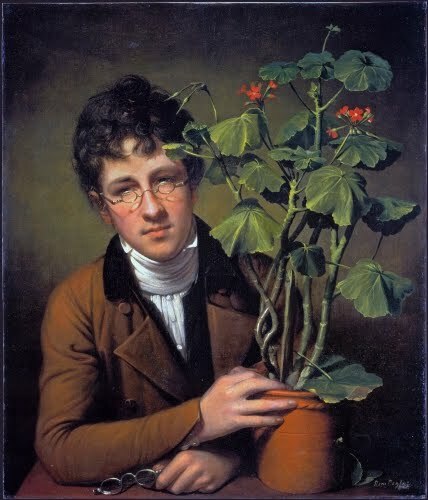 James is really credited as the instigator of the craze over still life by American patrons, but I’ve always considered Rembrandt Peale’s (1778–1860) portrait of his brother Rubens (1784–1865), Rubens Peale with a Geranium (National Gallery of Art), to be an outstanding early still life (1801). It is thought to have been the first geranium introduced in America, and it really does vie with Rubens for the star spot. Another brother of Rubens and Rembrandt, Raphaelle (1774–1825), was primarily a still-life painter. Two daughters of James, Anna Claypoole (1791–1878) and Margaretta Angelica (1795–1882), were also primarily still-life painters. Mary Jane Peale (1827–1902), daughter of Rubens, carried the Peale still-life painting dynasty into the 20th century! This is definitely not an Easter egg! 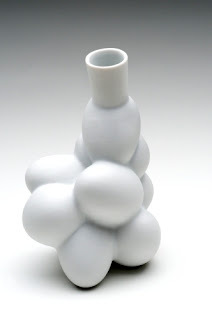 An unusual porcelain vessel, it is one of a set of three of differing sizes. What they all share in common is how they were created. The designer, Marcel Wanders, formed the mold from hard-boiled eggs that were encased in latex condoms. But, using unconventional and innovative materials is one of the hallmarks of the work of this Dutch designer. Wanders was born in Boxtel, Netherlands, and graduated from the School of the Arts in Arnhem in 1988. He first came to attention with his innovative Knotted Chair in 1995 that he made in collaboration with Droog Design in Amsterdam. It is constructed with carbon and aramide fiber cord, and an epoxy resin finish. Wanders emphasizes creating designs that stress humanity and a down-to-earth aesthetic. Wanders has designed works for many of the major design firms, such as Cappellini (1946–present, Arosio, Italy), Droog Design (1993–present, Amsterdam), Flos (1962–-present, Brescia, Italy), and others. He founded his own firm of Moooi—a tricked up version of the Dutch word mooi, or “beautiful” —in 2000. Wanders also extends his talents to architectural and interior design, and in the last few years the design of home appliances. This fabulous fabric was designed by one of my favorite fiber artists, Reiko Sudo. If you have read my blog for a while now, you know how much I love the revolutionary designs of Sudo. Failing the entrance exam in order to become a kimono designer, she founded NUNO Corporation in 1984 with Jun’ichi Arai (born 1932). Nuno means “cloth” in Japanese. 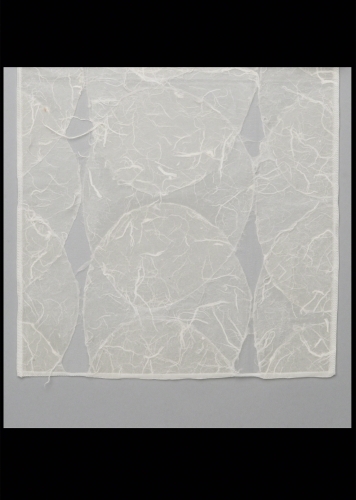 The company is dedicated to designing and producing textiles in combinations of unconventional materials and techniques, according to traditional Japanese aesthetics and in an eco-friendly way. When they started NUNO, Sudo and Jun’ichi were on the cutting edge, being among the first to use computers to design textiles. Designs such as Big Egg are meant to be versatile, used for fashion or interior design. Big Egg is made from Eichizen washi papers applied to ramie (a fibrous Asian plant stem) ovals and then to polyester. Materials such as this are made in limited quantities and are not mass-produced, industrially milled to simulate the aesthetic of hand-looming. Since this post has a vaguely Easter theme, I couldn’t leave you without a good art work of a rabbit, though it’s no Easter Bunny! Like Sudo Reiko, I’ve also blogged about Ogata Gekko in the past. I’m fond of artists who don’t quite fit into one stylistic category or another, and he certainly typifies that quality. A devoted follower of Chinese painting traditions, he was renowned in his time for his sophisticated lacquer work. During the 1880s he became committed to the rejuvenation of the ukiyo-e tradition of multiple woodblock prints, although he developed a style that avoided the overt linearity of the tradition prints of that style. His woodblock prints, where possible, imitated brush work. 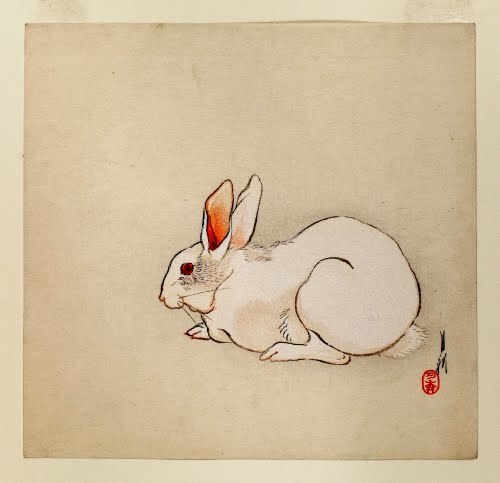 One sees that in this bunny in the gentle shading of the form.